Home Trades It Is Time To Get Bullish On Stocks? It Is Time To Get Bullish On Stocks? 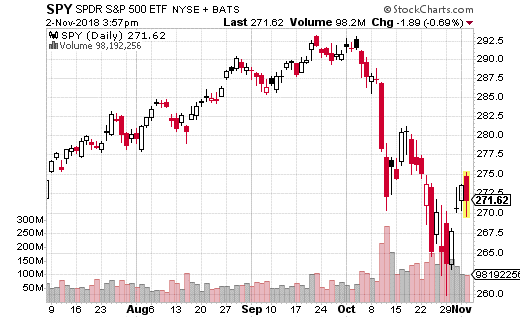 A well-capitalized trader purchased just under 20,000 SPY December 31st 280 calls for $4, with the ETF price at $272.69. The trade cost $8 million in premium, which is the max loss on the strategy should SPY remain below $280 at year’s end. Breakeven for the trade is at $284, and each dollar above that generates an addition $2 million in profits per dollar higher. $8 million is a lot to risk on a long options trade, so the strategist clearly believes the stock market is going to rally as we head into the new year. Moreover, this trade was labeled as an “Intermarket Sweep” which means the trader snatched up every available option at $4 across all exchanges. This type of action usually implies strong conviction on the trade. While there may be some volatility heading into the elections and FOMC meeting, at least this one massive trade is expecting a significant upturn in stocks by the end of the year. If you want to also get long the stock market through SPY, you can do a similar trade. But, instead of buying naked calls, you could execute a call spread and save yourself some upfront premium. For example, the SPY December 31st 280-285 call spread costs about $1.65 with the SPY at $271.30. That lowers your cost and risk, but still allows you to achieve a max return of 203% if SPY is at $285 or above at year-end expiration.